An Antique French Wreath and Watch Fob, both cast from the original antique pieces; over a century old, these lovely reproductions are hand crafted. They are Sterling Silver-plated and aged to a wonderful old world patina. 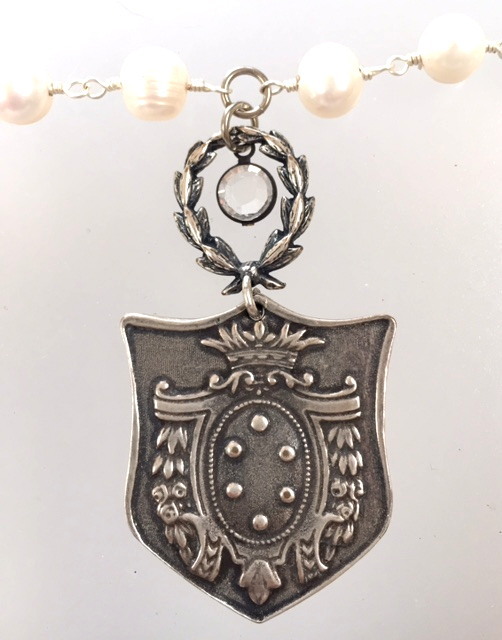 The Repoussee Fob is totally Romantic on both sides, with the Fleur de Lis (the French symbol of Royalty) on the one side and the reverse having a Cartouche with a Crown, Roses and Acanthus Leaves. Talk about French motifs!! The melange is poised on an enchanting French WWI Wreath on Genuine White Freshwater Pearls embellished with a Czech faceted Crystal. Necklace is 28" Long, (can be ordered any length), Fob/Wreath are 2" tall.